Many of our modern devices—from cell phones to electric cars—depend on charged batteries to operate. But when battery voltage fades, so does the amount of energy a battery can hold. This fading is especially problematic for certain lithium-rich cathode materials used to power things like electric cars; how the fading occurs isn’t well understood. 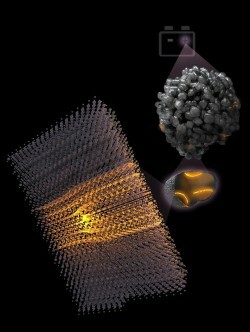 To help remedy the problem, a team of UC San Diego researchers applied heat and X-ray imaging differently to demonstrate for the first time the origins of voltage fade. In an article titled “What’s Causing the Voltage Fade in Lithium-rich NMC Cathode Materials?” and recently published in Nature Energy, physicist Oleg Shpyrko, nanoengineer Shirley Meng and their colleagues discuss their study of the causes of performance-reducing “voltage fade” that currently plagues a promising class of cathode materials called Lithium-rich NMC (Nickel Magnesium Cobalt) layered oxides. The researchers designed a regime showing that heat treatments removed the defects in the bulk structure of Lithium-rich NMC materials and restored the battery output voltage. The researchers were able to identify nanoscale defects or “dislocations” in Lithium-rich NMC cathode materials as they charged batteries at a range of voltages going up to 4.4 volts. The team also showed that heat treating the cathode materials eliminated most of the defects and restored the original voltage. They put the heat-treaded cathodes into new batteries and tested them at 4.4 volts, demonstrating that the voltage fade had been reversed. While the heat treating approach to reversing the defects is labor intensive and not likely to scale, the physics and materials science-based approach to characterizing and then addressing the nanoscale defects offers promise for finding new ways to address the voltage fade problem. “Our paper is mainly about unlocking the mystery of the dislocations that cause voltage fade in Lithium-rich NMCs. We don’t have a scalable solution yet to solving the voltage fade problem in Lithium-rich NMCs, but we are making progress,” said Meng. This research collaboration is part of the interdisciplinary work of the UC San Diego Sustainable Power and Energy Center, where Meng serves as director, and Shpyrko serves as co-director. Research at the Sustainable Power and Energy Center extends from theoretical research through experiments and materials characterization all the way to real-world testing of devices on the campus microgrid. This article was written by Cynthia Dillion for the Division of Physical Sciences news site, and originally published here.